Welcome to the Boss Guide! Last edited by Cthulu; 09-06-2015, 09:35 PM. 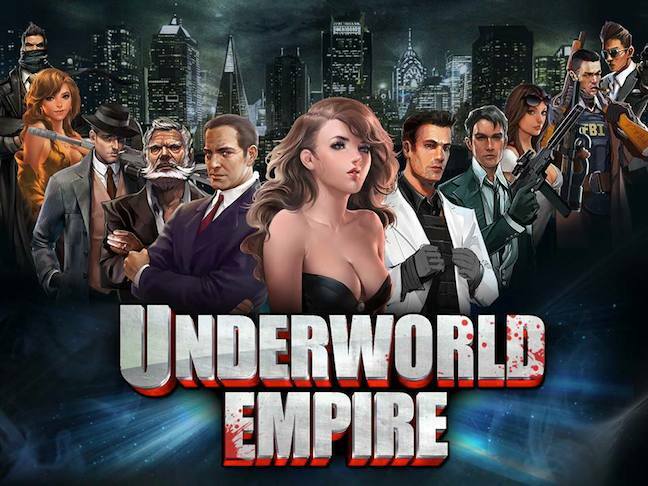 Whether they are from job areas or generated from unique pieces, bosses are a fun and core component of gameplay in Underworld Empire. This is a basic guide to various aspects of bossfighting and then more in-depth descriptions of individual bosses. This guide is the result of quite a bit of effort by the UE player community and is meant to be a fluid and adaptive guide via the associated comment/question/update thread. The UE Wiki is also a great resource for boss information. It is possible to hunt bosses with any build type but the easiest way is high attack and high stamina. Currently stamina refills to 1,000 from an FP refill but scratcher/event refills can fill higher. More stamina = more hits and higher attack will give more points per hit. In general, unless specifically leveling a class, Sniper is the best class for most bossfights. Knowing the phase/stage a boss is currently on and those coming up allows a player to join some bossfights to intentionally maximize their damage/points. An example would be a multi-opponent phase/stage that includes a sniper in which case a player entering as Heavy Weapons would more efficiently accrue damage/points. Instead of a general recommendation of one class for each boss it is better for the player to consider the specific needs of their account. Using the 2nd attack option or class-specific attack is typically recommended for accruing class experience. When fighting bosses, choosing LTs that boost attack (ex: Irina), critical chance (ex: The Dragon Lord, Pain), critical damage (ex: Vanquish) will increase the damage a player can inflict on a given boss which increases the points accrued. Other LTs like Duke, Red Countess, Midas, El Toro etc. can also contribute to bossfighting efforts. Stamina boosting LTs can help if equipped prior to leveling in order to increase the amount of stamina a player can hit with. The previously mentioned exp boosting LTs are also valuable considerations. Each player must adjust accordingly to their current LTs. Loadouts can be unlocked based on LT inventory which allow a player to switch between up to 3 sets of equipped LTs. These can be manipulated to meet various in-game needs and one of which can be specifically tailored to bossfighting. Insignias can be equipped to seated LTs in order to boost LT attack and critical hits. These have been discussed in-depth in other areas of the forums but basically keep in mind that defense and health are not as valuable in bossfighting. There are player achievements available for bossfighting that can yield stat points and favor points. These are divided into the number of times a player has fought-then-collected from a boss and speedkills. To attain the SP from a speedkill, it must be a 3-star speedkill. To collect from a boss, the player will typically need a minimum of 1,500-3,000 boss points to count towards the achievements. A player has the option of creating their own boss and subsequently killing it on their own, making it visible to their empire, and making it visible to their empire and the public. Clicking on the "i" in the gear shape will allow a player to not only change the accessibility and to see the possible drops for the boss but also to copy and share the unique boss code. These codes can be shared in empire chat, via PMs, in in-game chat rooms, on World Chat and in commonly used 3rd party messaging services used by UE players. There is also a cellphone under this icon or a call-for-help tab below which will allow a player to send out a call for help to all of their allies. Bossfighting is a great way to meet and cooperate with players across a wide spectrum of accounts and empires. *note, after completing a job area, it is not essential and is sometimes undesirable to create the area boss, simply hit the x at the top of the pop-up and continue on. You will be able to summon that particular boss via the acquired phone at any point in the future. Bosses can drop a wide variety of items (see entries below). In Underworld Empire, the points recommended to stop hitting a boss at are referred to as thresholds. Most bosses can drop up to 3 epic items and thresholds are recommended based on observations by the community on which boss point amounts drop 1, 2 or 3 epics. 2 epic drops can be considered guaranteed but 3 epic drops happen 90-95% of the time and are not guaranteed. A good point to understand with empire or public bosses is that once you have passed that 3rd epic threshold - you do not acquire more boss points for your empire and you do not acquire more individual rewards (legend bosses are an exception). This is called over-hitting and is typically not recommended unless required to prevent the boss from fleeing. *note, Fled bosses do not incur any deteriment to the player account or empire except as a waste of stamina and resources. There are no tricks to Legendary drops but you do need to be at the 2-epic threshold at least for a chance to drop them (source: Max). It is possible that over-hitting the boss beyond the 3-epic threshold may hinder your chances at dropping a legendary but this is unconfirmed. It is also possible that there is an effect from the individual player contribution in the context of the group as a whole who hit that boss but this is also largely unconfirmed. It can be frustrating and take time but it is possible to drop legendary items. It's between .2 and .5% I think give or take it has a formula dealing with contribution. Generally, hit over 50% AP = You get the first chance(pretty low) to receive legendary items, more points higher chance. For Legend Bosses, the threshold is 75% AP. Legend Bosses are unique bosses that require a phone to summon them but also a passport to join them. 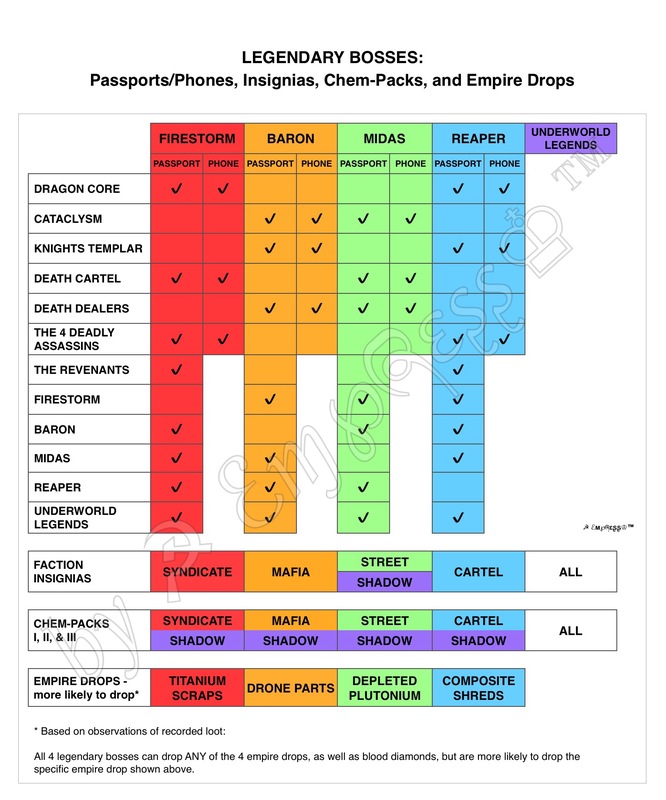 The table below lists the current sources of phones and passports for the current legend bosses. The phones are re-usable but passports are consumed as you join the legend boss. Once in a legend boss, there are the regular attack options as well as silver and gold bullets. Silver bullets are good for extra damage and experience (especially if close to leveling but too close to burn a refill). Gold bullets in legend bosses help contribute to powerful boss-specific, phase-specific attacks - basically will deliver a supercharged boss attack and bump contributing player points up when the group attack hits. Last edited by Cthulu; 09-05-2017, 01:56 AM. Last edited by Cthulu; 09-06-2015, 08:26 PM. Last edited by Cthulu; 09-06-2015, 08:25 PM. Last edited by Cthulu; 09-06-2015, 08:27 PM. Last edited by Cthulu; 09-06-2015, 08:28 PM. Last edited by Cthulu; 09-17-2015, 06:42 PM. Last edited by Cthulu; 09-06-2015, 08:29 PM. Last edited by Cthulu; 09-06-2015, 08:30 PM. Last edited by Cthulu; 10-07-2016, 03:58 AM.